The NT is a beautiful place. You know that. But the Territory needs your help. Right now, 83% of the NT is under oil or gas license, with companies lining up to frack thousands of wells across the Territory. The Federal Government is piling the pressure onto the NT government to open to up gas reserves and allow fracking through our precious groundwater. Territory farmers, cattle stations, tourism businesses and NT communities have a clear view. We won’t accept any risk to our land and water from fracking gasfields. But there is a big risk that the Gunner Government will ignore our voices. That’s why we have to show the NT government that fracking is not an option. 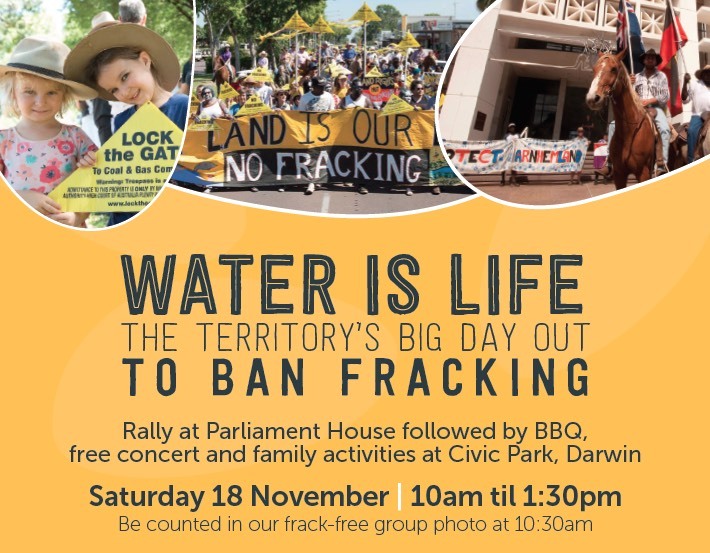 Join Territorians for a rally in Darwin at 10am on November 18 at Parliament House. The NT Government is currently deciding whether or not to lift their temporary ban. The people of the NT need to speak up and protect our water, land, health, climate and future from dangerous shale gas fracking. The resistance is powerful. People across the NT are standing up against these fracking companies and telling the government we want a permanent fracking ban. ​The Territory​ need​s​ you to join us to send the government a clear message they won’t miss. Where: Meet at NT Parliament then free concert, BBQ, kids activities in Civic Park. When: 10am Saturday 18th November 2017. Group photo at 10.30am.